EXOTIC CARS MEET A LOVE STORY "NOTHING IN LIFE IS A COINCIDENCE" It was the day of a special occasion in my life, when my entire future was rewritten and set on a new course Or was this always part of destiny that I believed you cannot run from? My Destiny. Now Ours. Together. Exclusively. As I watched him at the show I never planned on attending â I was certain of one thing about his velocity: ONLY GOD is capable of catching him. The moment we met, there was no looking back on a past life down a darkened and lonely road any longer. Before him I had never dated anyone. Before him I lead a normal good-girl life. With him my plus size curves and unique facial features are loved and adored beyond a passionate and lustful extent Beside him I became queen to the messiah of an exotic cars racing universe I defied heaven for As fate would have it, regrets collected like old friends ready to relive both our darkest moments Itâs always darkest before the dawn, but to see the sunrise at the end of the finish line, there are SEVEN words of a pledge barricading the way: Oath Griffin Blood Hypersonic Racers Breakneck League Cauterized words onto his soul that will decide if he is either a villain or a savior The ultimate sacrifice must be made by him alone Which will he choose? Which will he let go of? Which means more? This is our journey This is where our racing legacy with fast cars begin. Contemporary, Erotica, New Adult, Romance : Due to strong language and sexual content, this book is not intended for readers under the age of 18. "You can't run from Destiny...All Roads Lead to the same destination." - I live by this self-made moto. I'm addicted to Italian Ice-Cream & Exotic Fast Cars *this will be made VERY clear in my book* My home is in the city of Lost Angels aka Los Angeles in the U.S.A I am plus size full figured girl and so is my leading lady in my debut novel. Single, 28 years of age, I am the middle sibling to an older brother and a younger sister. I am loud, funny and I have no shame in life. I only read dark themed novels or extreme alpha male storylines and I am addicted to music more than the average human should be. I cannot live without it especially 90's music. I first started writing at the age of 13 years old where I had won awards in school for my writing skills and original storylines. 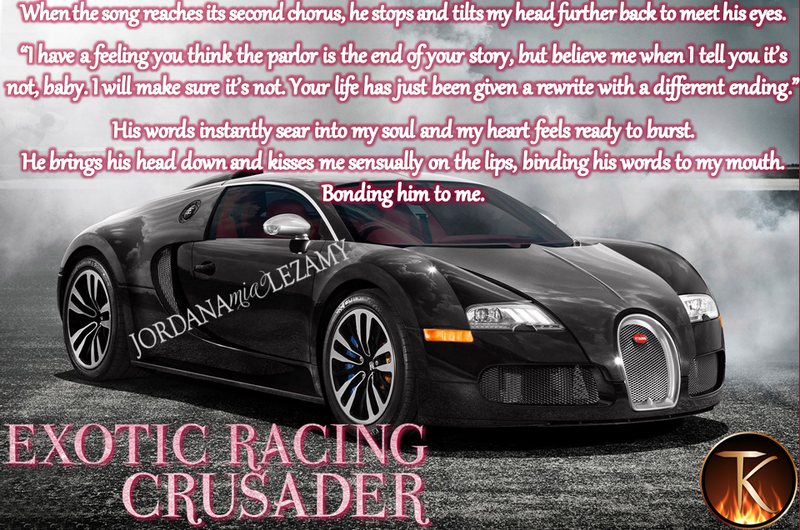 Such as the one in my debut series Exotic Racers: Exotic Racing Crusader + Exotic Racing Commander + Exotic Racing Conqueror all to be released in 2015.